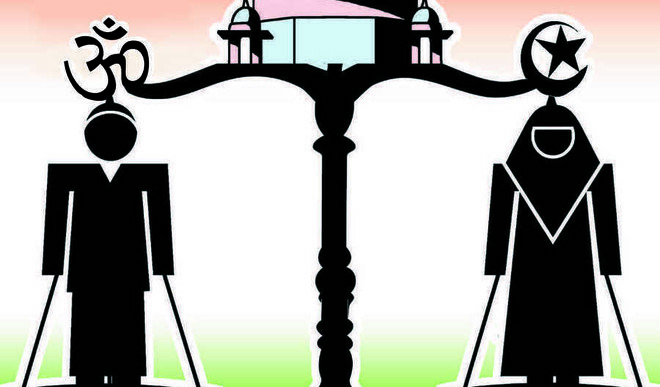 The issue of the Uniform Civil Code has recently resurfaced in India’s political discourse, particularly because many Muslim women who have been affected by personal laws have begun knocking on the door of Supreme Court to protect their fundamental equality and freedom, in accordance with constitutional provisions. The Union Law Ministry has recently asked the Law Commission to examine issues relating to the implementation of the uniform civil code. What is Uniform Civil Court? The Uniform Civil Code in India proposes to replace personal laws based on the scriptures and customs of each major religious community in the country, with a set of rules common to each other. Article 44 as a Directive Principle of State Policy directs the State to secure a uniform civil code for the citizens applicable throughout the territory of India. Its particular goal is towards the achievement of gender justice. It does not seem that the State has made any effort to introduce a uniform civil code in India but the judiciary has recognized the necessity of uniformity in the application of civil laws, relating to marriage, divorce, maintenance, etc. What is the need for Article 44? The object behind this article is to effect an integration of India by bring all communities on the common platform on matters which are at present governed by diverse personal laws but which do not form the essence of any religion. The Supreme Court has regretted that Article 44 has so long remained a dead letter and recommends early legislation to implement it. It requested the Government of India through the Prime Minister to have a fresh look at Article 44 and “endeavor to secure for the citizens a uniform civil code throughout the territory of India”. The Apex Court regretted that Article 44 has not been given effect to. Parliament is still to step in for framing a common civil code in the country which will help the cause of national integration by removing the contradictions based on ideologies. In a pluralistic society like India, where people have confidence in their respective religious beliefs or doctrines that have been presented by different religions or their offspring, the founding fathers were, when they made the Constitution, faced with problems to the people of India to unite and integrate the different religious professing faiths that were born in different castes, beliefs or subsections of society, speak different languages and dialects in different regions and provided a secular constitution for the integration of all sections of the society presented as united Bharat. The guiding principles of the Constitution itself visualize diversity and have tried to promote uniformity among peoples of different denominations. A uniform law, although highly desirable at the discretion of them on a train perhaps, may be counterproductive to the unity and integrity of the nation. In a rule by the rule of democracy of the law, a gradual progressive change and order must be brought about. To make laws or to amend a law that is a slow process, and the legislator tries to fix where the need is felt most. It would be to believe it inappropriate and erroneous that all laws should be applied equally to all people in one go. The disaster of default, which is the most acute, can be solved in the process of law. a) To declare Muslim Personal Law which allows polygamy as void, as offending Articles 14 and 15 of the Constitution. b) To declare Muslim Personal Law which enables a Muslim male to give a unilateral Talaq to his wife without her consent and without resort to judicial process of courts, as void, offending Articles 13, 14 and 15 of the Constitution. c) To declare that mere fact that a Muslim husband takes more than one wife is an act of cruelty within the meaning of sub-section (8) of section 2 of the Dissolution of Muslim Marriages Act, 1939.
d) To declare Section 2(2), 5 (ii) and (iii), 6 and Explanation to Section 30 of the Hindu Succession Act, 1956, as void, as offending Article 14 and 15 read with Article 13 of the Constitution of India. e) To declare Section 2 of the Hindu Marriage Act, 1955 as void, offending Articles 14 and 15 of the Constitution of India. The court stated at the very outset that the petitions mentioned above did not deserve disposal of merits, as the issues involved were matters of policy with which the Supreme Court would not ordinarily have concerned. After the initial hesitation, the Supreme Court voiced its concern, indicating the urgency to have uniformity in personal laws. In Mohd. Ahmed Khan v. Shah Bano Begum, the question was pertaining to the responsibility of a Muslim husband to maintain his divorced wife beyond the period of Iddat, if the wife was not able to maintain herself. The Supreme Court held in this case that Section 125, Criminal Procedure Code, 1973 (CrPC) which imposes an obligation on all husbands, is secular and applies to all religions. It applies to all Indians in general and overrides the personal law in case of conflict between the two. The court also found it regretted that article 44 of our Constitution had remained a dead letter. There is no evidence for formal work for the design of a common civil code for the country. A belief seems to have perished, whether it is for the Muslim community to take a lead on the issue of reforms of their personal law. A common civil code will help the cause of national integration by eliminating the unjust loyalties of the law that have contradictory ideologies. No community is probably the cat bell by making free concessions on this issue. It is the state, which is charged with the obligation of a uniform civil code for the citizens of the country and in a secure manner. The judgment in the Shah Bano case led to the enactment of Muslim Women (Protection of Right on Divorce) Act, 1986. The constitutionality of this Act was challenged in Danial Latifi v. Union of India , the petitioners, inter alia, submitted that provisions under Section 125 CrPC reflected the moral stance of the law and ought not to have been entangled with religion and religion-based personal laws; that the Act is violative of Article 14 and 21. The Supreme Court, while upholding the validity of the Act, observed that if on a rule of construction, a given statute will become ultra vires or “unconstitutional” and therefore, void; whereas on another construction which is permissible. In our society, A Muslim man is allowed to keep more than one woman, but not for a Hindu man. Of course, no Hindu or Muslim woman can have more than one man in our patriarchal society. Hindus can form an undivided family (HUF) to manage their assets better while reducing their taxes, but not Muslims or Christians. Christians cannot divorce before the end of 2 years of marriage, while other communities can do so after 1 year of marriage. Christian women do not receive any share in the property of deceased children, while rules are different for other communities. This chaotic situation is the result of religious laws relating to marriage, divorce, succession, inheritance, maintenance, etc. The question of the uniform civil code had been raised several times since independence, but during Shah Bano case after the decision of the Supreme Court in 1985, this issue has acquired a distinct community connotation. • Secondly, it would be a tyranny to the minority. “A further argument has been advanced that the enactment of a civil code would be tyrannical to minorities. Is it tyrannical? Nowhere in advanced Muslim countries has the personal law of each minority been recognized as so sacrosanct as to prevent the enactment of a civil code. Now look at the disadvantages that one will perpetuate if there is no civil code. Take for instance the Hindus. We have the law of Mayukha applying in some parts of India; we have Mitakshara in others; and we have the law of Dayabhaga in Bengal. In this way even Hindus themselves have separate Hindu laws for themselves. Are we going to permit this piecemeal legislation on the ground that it affects the personal law of the country? It is, therefore, not merely a question for minorities but it also affects the majority. Although Munshi’s observations, have not lost their relevance, except that codification of Hindu law was undertaken soon after the commencement of the Constitution, no solid steps have been taken to provide uniform civil code. On the contrary reliance on this article by the Supreme Court in upholding the right of maintenance of a Muslim divorcee under Section 125 of the Criminal Procedure Code has boomeranged resulting in a separate law of maintenance for Muslim female divorcee. Later the court again reminded the State of its obligation under this Article and issued directions to it to take appropriate steps for its implementation and inform the Court of such steps. No progress, however, seems to have been made in this regard. Even the Bhartiya Janta Party led government, which once strongly spoke for uniform civil code, sidelined the issue. Perhaps a uniform civil code may have to wait indefinitely until a general consensus among all communities in the country emerges in this regard. Such consensus may not emerge in the foreseeable future because of growing support for pluralism within a State. The Court has also retraced its steps and has stated that it never issued any directions for the codification of a common civil code. In Sarla Mudgal v. Union of India, the Supreme Court has directed the Prime Minister Narsimha Rao to take fresh look at Article 44 of the Constitution which enjoins the State to secure a uniform civil code which, accordingly to the Court is imperative for both protection of the oppressed and promotion of national unity and integrity. The court ordered the Union Government through the Secretary to Ministry of Law and Justice, to file an affidavit by August 1995 in which the steps and efforts of the government were given to ensure a civil code Uniform for the citizens of India. Enforcing Uniform Civil Code whether Need of the Hour to Help National Integration? More than 65 years after independence, there are several things still to be embarrassed about. We have not yet provided drinking water, electricity and road access to all villages. We have not ensured food, shelter and education to all. We still see crores waging a daily battle in their attempt to cross a big line, mystically named below ‘below poverty line’. “These are huge socio-economic problems that cannot be solved overnight” is a line that has been shamelessly thrown at us for decades by those responsible for governance. We are embarrassed when India slips this year’s list of honest countries to be ranked behind China from 72nd to 85th position. Wonder whether any nation has ever asked an embarrassing question on corruption. These embarrassment on ‘roti, kapda and makaan’, touching everyday lives of citizen breach constitutional mandates as well. Right to Life, most basic among Fundamental Right, has an embarrassing track record despite the Supreme Court reiterating its inviolability time and again. Right to Life still remain a mirage to a vast majority. Among many other Supreme Court reiterations or constitutional mandates, apart from inviolability of ‘right to life’, is the one on uniform civil code. Uniform Civil Code, under Article 44 of the constitution has a chequered history in the Apex Court, beginning with Shah Bano Case. The Court had maintained its anguish in Shah Bano judgment saying that constitutional provision had remained a dead letter, there is little to feel embarrassed, when we have not yet been able to fully protected the Fundamental Right, why talk of a provision under ‘Directive Principles of State Policy’? Article 44 read along with Article 37 would mean that the constitution terms Uniform Civil Code principle as fundamental to governance and casts a duty on the State to bring a law to this effect. Only a duty, not a mandate is the unembarrassed excuse of those empower for more than half a century. Three Epic Court judgments, spread over two decades, talked of achieving national integration by giving effect to Article 44. But, in this torrid time of governance, anyone bothered about the national integration? Status of Uniform Civil Code as a Fundamental Right: Personal laws often take place on the scope of fundamental rights also by shifting the burden of sanitizing discrimination into personal laws to parliament. Surprisingly, the Supreme Court did not hesitate when another policy, see Part IV, as well as the right to education, is fully effective and it becomes a fundamental right. A similar approach has not invoked the constitutional rule to bring about a uniform civil code, although the courts are urging the government of the day again and again to take the necessary steps in this direction. Civil law in Goa, which was derived from the Portuguese Civil Procedure Law, could be a useful starting point for a change and bring UCC. The coastal State continued its practice to treat all communities immediately after the entry of the Indians. The Goa Civil Code is largely based on the Portuguese Civil Code (Portugues Codigo Civil) of 1867, which was introduced in Goa 1870. All marriages must be registered: First step towards Uniform Civil Code – the Supreme Court has held that all marriages, irrespective of their religion, be compulsorily registered. Moved by the plight of women fighting for their rights under marriages like maintenance and custody of their children, a two Judge bench of the Supreme Court comprising Arijit Pasayat and S.H. Kapadia directed the Centre and State Governments to amend the law or frame rules and notify them within three months. The Court directed the government to provide for “consequences of non-registration of marriages” in the rules which should be formalized after inviting public response and considering them. The Court said the rules so framed would continue to operate till respective governments framed proper legislations for the compulsory registration of marriages. Giving no room for appeasement or dilution of the objective to be achieved through such legislations, Justice Pasayat said all new laws to be framed by the governments have to be placed for scrutiny before the Supreme Court. The Court felt that this ruling was necessitated by the need of the time as certain unscrupulous husbands deny marriages leaving the spouses in the lurch, be it for seeking maintenance, custody of children or inheritance of property. The ruling of the Court will itself facilitate the object of having a common civil code as most the problems relating to it are due to the non-registration of marriages. 5) Deter husbands from deserting their wives. The desirability of the Uniform Civil Code can hardly be doubted but, it can concretize only if social climate is properly built and the masses awakened to accept the change. Uniform civil code is the need of the hour. A strong political will is necessary for the same with the feeling of tolerance towards other religions and mutual respect to a part of each of India. I think at the time, the time has come for us to try to push uniform civil code through. In summary, in the latter, we can say for citizens of different religions and confessions, it is imperative that the promotion of national unity and solidarity a uniform code is an absolute necessity on which there can be no compromise. A true spirit of secularism must be manifested by all in the realization of the same thing.